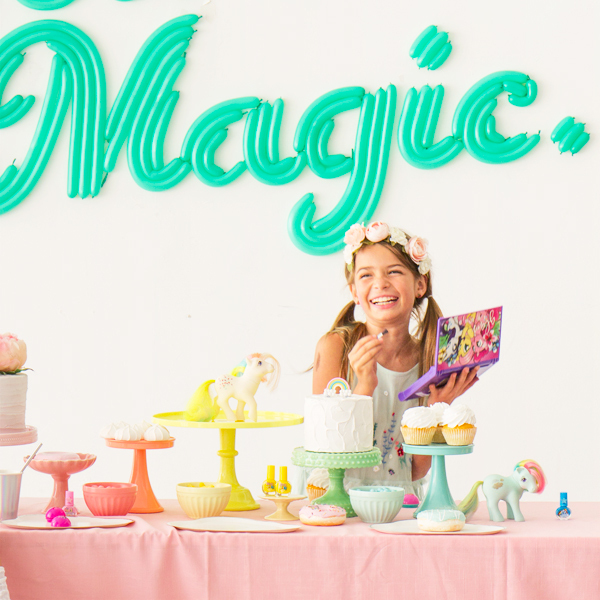 Today we have partnered with TownleyGirl to throw a My Little Pony Kidchella party! Our team has so many fun memories of My Little Pony from growing up, we were so excited to revisit our childhood favorites! We even included some ‘old school’ ponies at the party! With festival season is in full swing, we naturally decided to incorporate some playful nods to festival fun! Read on to see how we planned the full party! 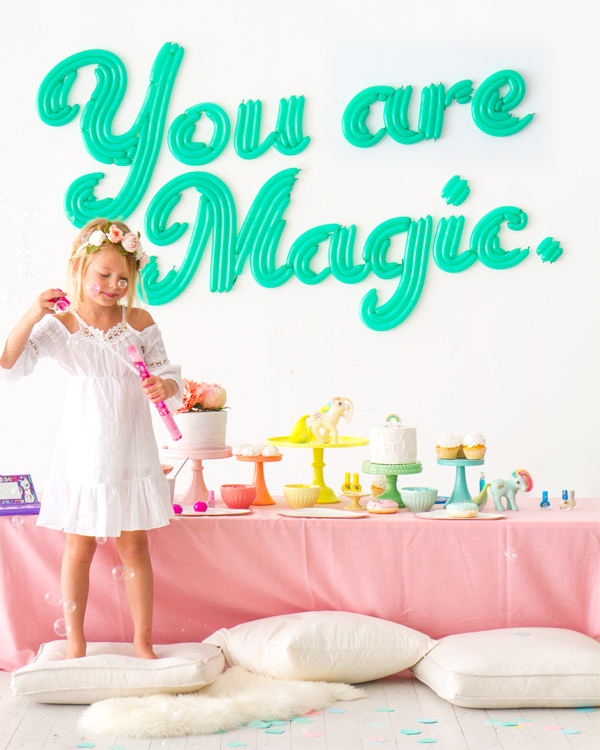 Incorporate a “Kidchella” theme (think flower crowns, bubbles, rainbows, glitter!) Every party we throw with a makeover element is a big hit! We supplied cute makeup, and nail art supplies. For this, TownleyGirl makes tons of fun and safe cosmetics and hair accessories! For this party, we raided their stash of awesome My Little Pony products! 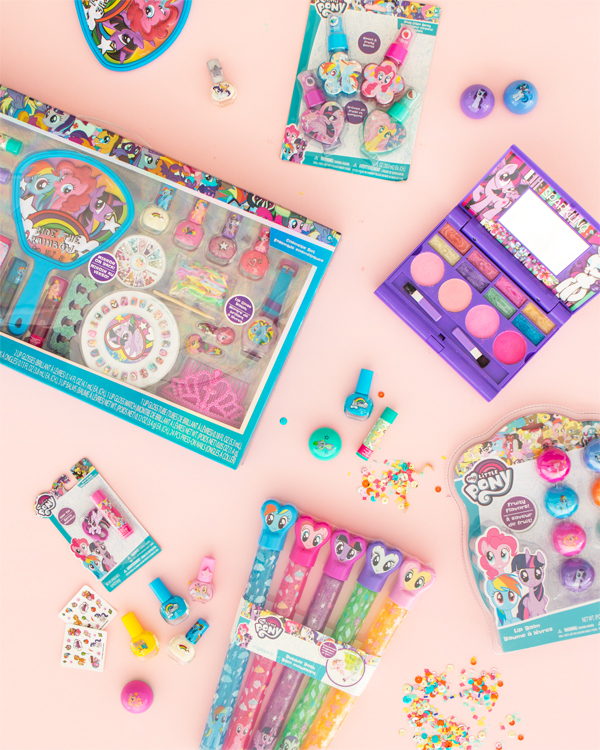 They have everything from lip gloss, to nail polish all in super cute sets, perfect for gifting! The girls were obsessed with their stuff so you get bonus Mom points for providing the best festival party swag! 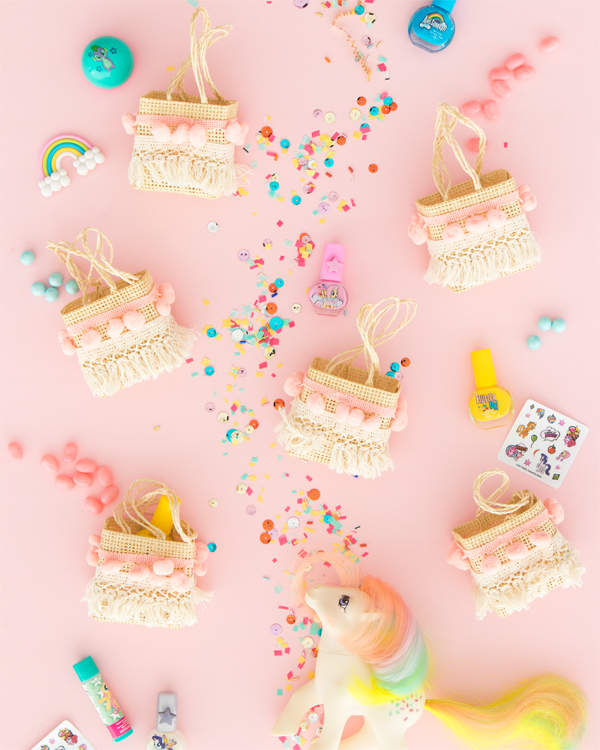 Supply cute favor bags! We used customized straw bags for maximum festival vibes! Fill them with My Little Pony goodies; the nail polish, lip balms and hair clips are great for this! 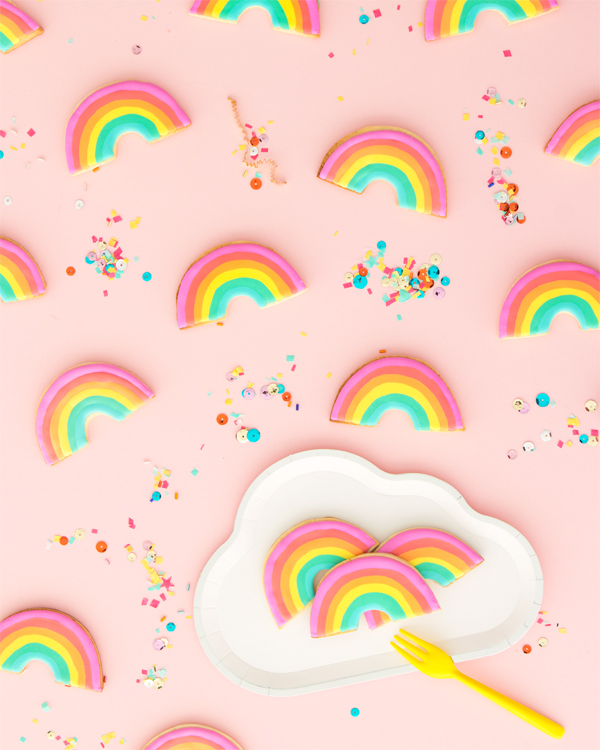 Rainbow cookies! 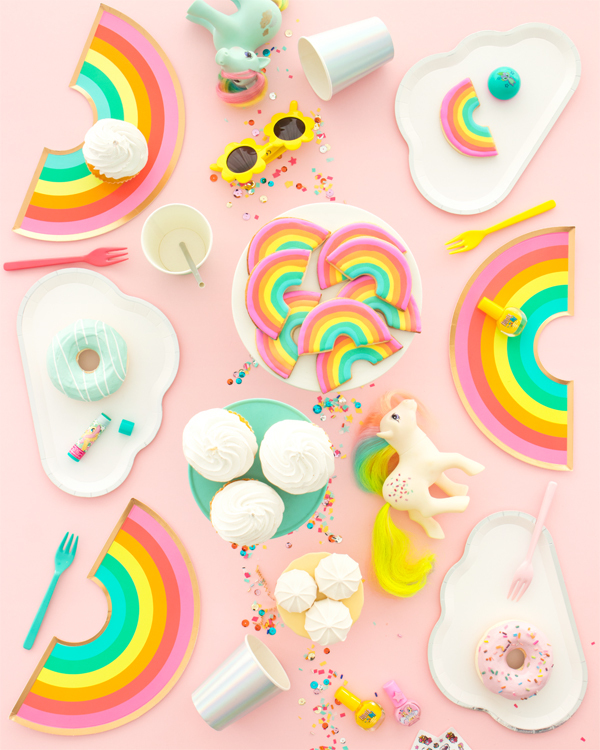 We love Rainbow Dash and her amazing rainbow mane and our rainbow plates were the perfect match! We had a local baker make rainbow cookies to match our theme. 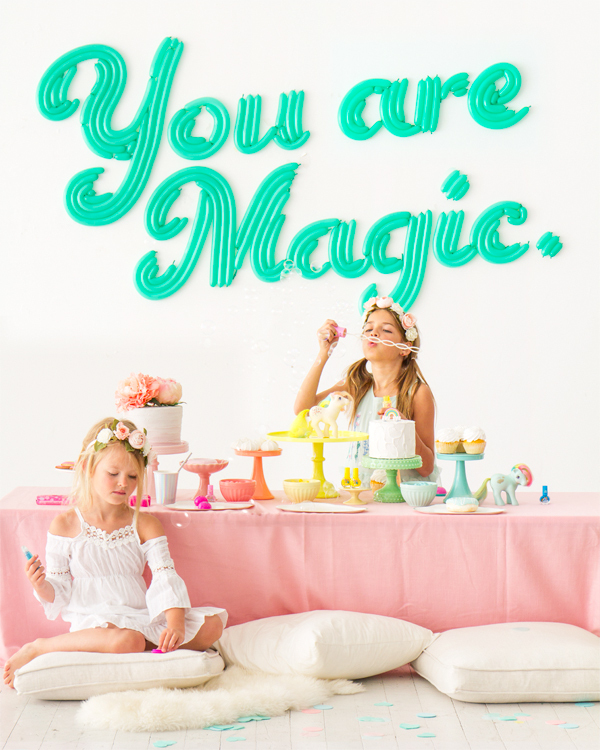 Create a colorful “You are Magic” banner to sit behind your party table! These are so fun to make, you can pick any phrase you like! Instructions below. Step 1: Choose a cursive typeface that you like. Use a word processor and type your phrase as large as possible. Create a PDF, then project the phrase onto a large blank wall and trace lightly with a pencil. Step 2: Inflate a bunch of 160Q balloons. Release a bit of air from each balloon before knotting so that the balloon has less tension, then trim off the balloon tails. To make balloons to size, inflate a balloon to the length you need, knot both ends, and trim off the leftovers. Step 3: Fill in the design with pieces of double-faced Shurtape, then remove the paper backing. Attach balloons and you’re all set! TownleyGirl is offering Oh Happy Day readers 30% Off Your Entire Order. Use code OhHappyDay30 at checkout ($30 min purchase). Thanks to little S and little M for modeling! This is too cute! Love how the little girls are dressed #Kidchella style. Omg. Who gave you guys permission to be sooo cute?? LOVE THIS! My nieces would go insane for a party like this (they love makeovers)! Can’t wait to try it out! Yes!!! I used to LOVE My Little Pony! I think lots of adults would go for this party theme too! !